Gentlemen, as residents of an island somewhat known for experiencing its fair share of wet weather, why is it that more of us do not give more care and attention to our umbrellas? 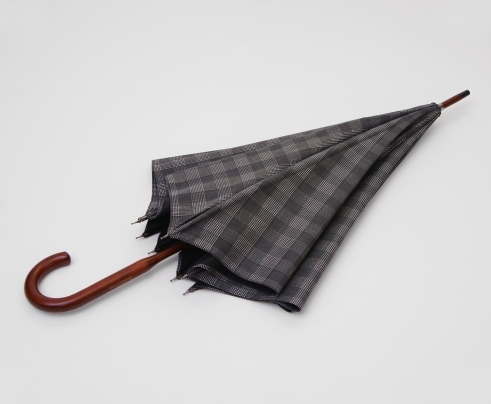 As we’ve said before, a true gent is never unprepared, and with our fair country’s unpredictable weather patterns, being properly prepared for a downpour is a necessity. How many £5 umbrellas have you lost or broken in your life? Well, it’s time to break the cycle and invest in a well-made brolly that will last you for years to come. 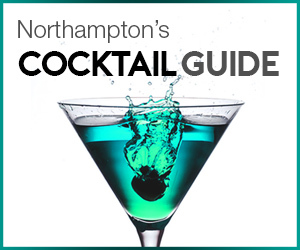 We will help you make the right choice to ensure you are equipping yourself with a well crafted, statement-making accessory which will see plenty of usage in the winter and spring months. The canopy is a central part of an umbrella and will determine whether you remain dry and stylish or end up resembling a drowned rat. It should be completely watertight; sitting tautly on the umbrella’s ribs. This is the very first element that should be considered when purchasing your umbrella. Functionality before fashion. How many times have we seen a strong wind turn an umbrella inside out, leaving the owner wet, cold, embarrassed and struggling to fix it. That is the result of a poor quality frame. Good quality frames will be able to withstand the wind without collapsing. Avoid aluminium frames which are cheap, flimsy and will break when faced with strong winds. 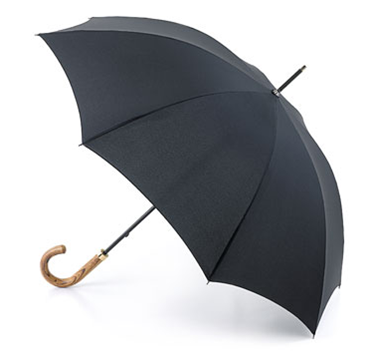 Look for umbrellas with nickel, fibreglass or tempered spring steel frames to see you safely and dryly through strong autumn and winter winds. No, we are not referring to the 70s Harlem detective. Selecting the right shaft size is only an issue with full-size umbrellas. It is important that the brolly you purchase is the right length for your height to ensure that it is comfortable to use and also to carry. Compacts are adjustable so the shaft is not so much of an issue. The shaft can also come in a range of materials, from wooden which is often rigid, sturdy and on the heavier side to metal tube which is typically made of steel and hollow, making it lighter but also more susceptible to bending. Each has their own advantages and disadvantages. Whilst a full-sized umbrella can be used as a statement-piece even without the rain, a compact umbrella has the advantage of convenience which is not to be underestimated, especially in the summer when showers can suddenly occur. 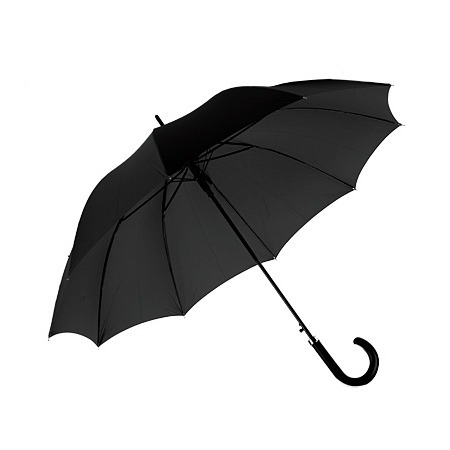 The most versatile colour of umbrella for men is black, which will go with any colour. Black is not the only colour that can suit an umbrella however; there are range of colours available that we can recommend to keep you looking stylish whilst staying dry. The full-sized umbrella has multiple purposes. It can be used as a walking stick and can also be used as a weapon to fend off undesirables who set upon you in the street (OK maybe the latter is a little extreme). Due to the umbrella’s larger size it is able to provide greater shelter from the rain than its compact brother and the longer spokes prevent it from turning inside out in strong wind. Fulton umbrellas are made from the highest quality materials and are designed to reduce damage by the wind. Their outstanding level of workmanship has been recognised through their award of the Royal Warrant to Her Majesty the Queen. They are an excellent addition to any man’s wardrobe and will boost your fashion credentials. 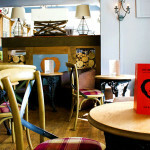 London Undercover is a relatively new company founded by Jamie Milestone in 2008. They use classic techniques combined with a modern twist. This black and grey version is perfect for carrying to the office and the colours are wonderful for a classic look and pairs wonderfully with tweed. 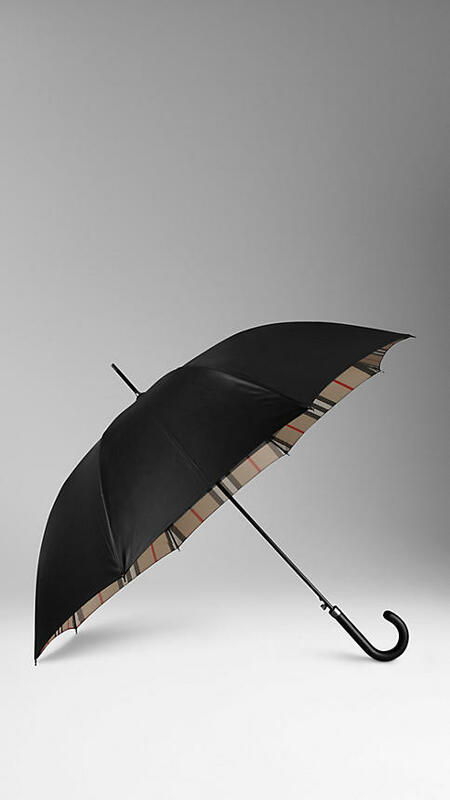 This Burberry walking umbrella has the distinctive Burberry style which is more popular and fashionable than ever. Compact umbrellas are more popular today than the full-sized umbrella. 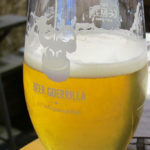 This is due to how easy they are to carry when not in use whilst being easily deployed when the skies open unexpectedly. They were once considered a status symbol before the market was flooded with cheap, flimsy imports. 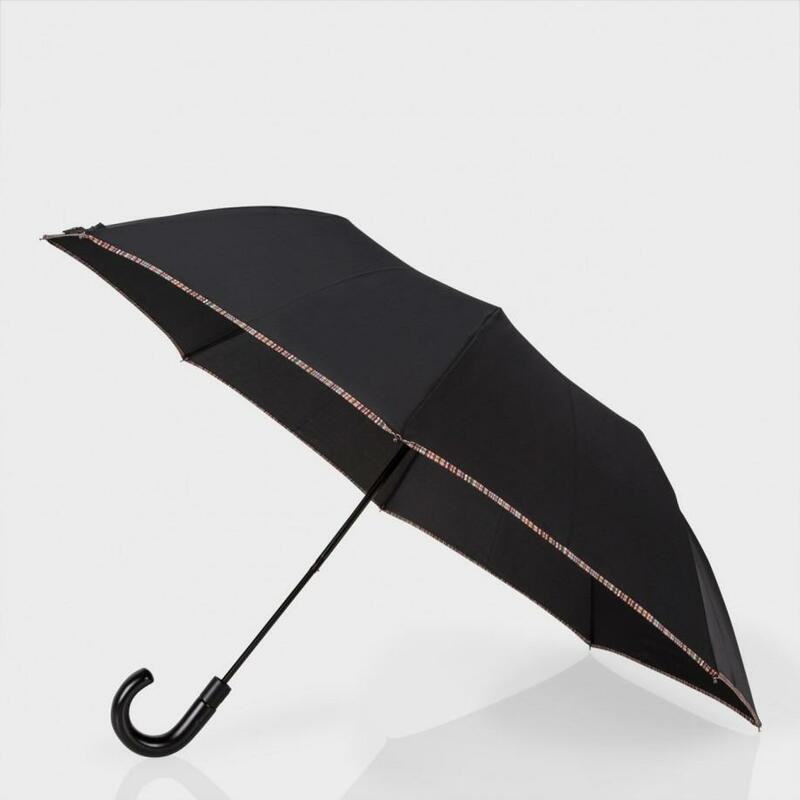 Compact umbrellas can be found in a wide variety of colours and styles and again black is ideal for use when on the way to the office and complements almost any outfit. We would suggest when purchasing, to take all off the factors we identified above into account to ensure that you do not have to repurchase your umbrella numerous times. Do not underestimate how valuable a good umbrella. 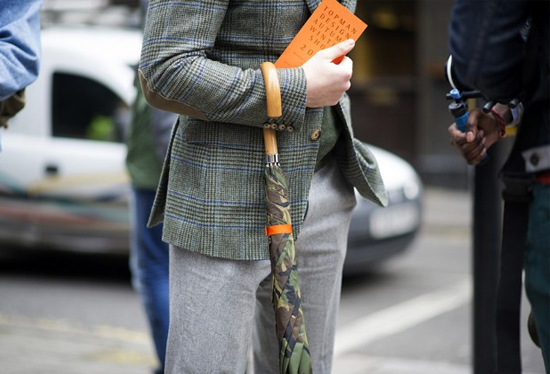 Regardless how well dressed you are, once you’ve been caught in a downpour, any stylish flair will be washed away. A good umbrella is for this reason alone a vital accessory to own all year round to ensure that you remain stylish at all times. Beyond their functionality, umbrellas can also prove to be statement making pieces, especially a full sized brolly, so make sure to take care in choosing one that is versatile enough to complement your outfit. Lastly, quality is key. Having a good quality umbrella that can withstand the British weather may mean investing more, however as long as you have followed our guide for what to look out for, should see you through many a storm.